Gladiator Trailer Trailers are important to films for a number of reasons. They promote a film and present it to the target audience, in order to encourage them to watch the film. Trailers also give the audience expectations of the film. The audience like to know what to expect of a film before they go and see it. The audience is given a taste of the story and the basic plot. This is done by showing an array of clips that are edited to a certain degree. The trailer normally ends with a 'cliff-hanger'. This is a term used to explain when an audience is not told the ending of a story. This makes them wonder in suspense as to what the possible endings could be, therefore drawing them in to watch the film. A voiceover is the narrator of a trailer. It connects the clips together to help the audience understand what the film is about. 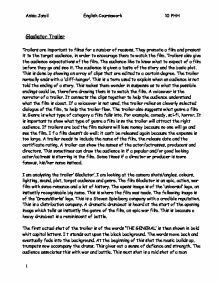 If a voiceover is not used, the trailer relies on cleverly selected dialogue of the film, to help the trailer flow. The trailer also suggests what genre a film is. Genre is what type of category a film falls into. For example, comedy, sci-fi, horror. ...read more. Sympathy is created for the hero by the expression on his face, a depressed, concerned look. Sympathy is also created by the dark expressive lighting. This shot is a close up shot, helping to see the hero's expression. After this shot we see another shot of words, 'WHO DEFIED AND EMPIRE'. This is the last of these repetitive word shots. They fulfil their purpose, which was to help the trailer flow and tell the basic plot. This adds to intrigue, as to how one man can defy an empire. Also the word empire relates to the genre of roman history and an epic. After this shot, we immediately hear a change in music. It now involves more instruments and gives a sense of determination, as the hero had determination to defy an empire. It also makes it instantly recognisable as an epic element of the film, because the music is not modern. Subsequently we see a range of clips that have been fast edited to increase excitement. The first few clips are of the emperor, the gladiators and the chariots. All these give clues to this film being an epic. ...read more. The sound behind this frame changes is influential strong aggressive and memorable. This continues the theme of defiance and vengeance. The following shot is of some fighting scenes. Then we see the title of the film 'GLADIATOR'. This is in capital, gold, 3D letters. It is given nearly at the end of the trailer so it will stay in the audiences mind. The last shot is of the words 'SUMMER 2000 A.D.' The letters are in white letters and stand out upon the black background. The style of the whole genre is carried off at the end by the end letters associating with roman culture. Overall I think this trailer is effective and very successful. It is a lavish production with no expense spared. It is full of dramatic action and fighting scenes. It is about good over coming evil and relies heavily on action and clever dialogues to interest the audience. It is very effective in promoting the film and interesting the audience. It has good uses of font, colour music and dialogue. In my opinion I think too much of the plot and the ending was give away. This might lose some of the audience, as the already know the storyline. 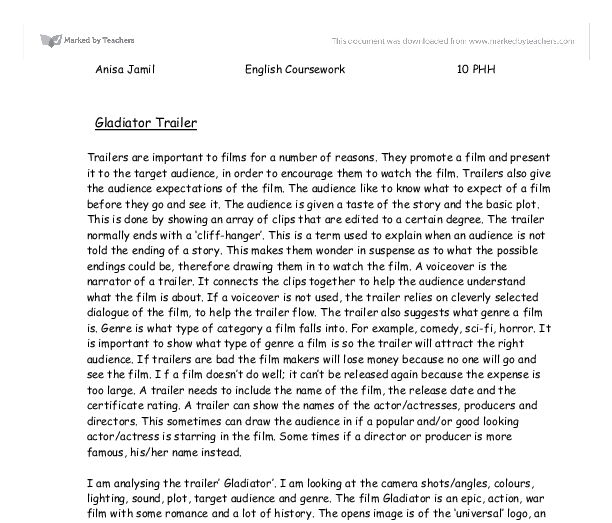 Anisa Jamil English Coursework 10 PHH 1 ...read more. Mid angle shots are used when Shrek and donkey are relaxing together, and when Shrek has cooked Princess Fiona a male. Such shots are helpful as they show characters socialising with each other. They are on an equal footing. Close up shots are also useful for focussing the viewers attention on the characters' emotions. being killed, or the Terminator failing his mission to make the audience want to watch the film to see what happens. Arnold Schwarzenegger is a very popular, highly paid actor, and people would think that if he was in it then the script is good. One of the Jews says "it could be worse" on entering the horrid ghetto and it does get worse, this shows the hopefulness in them. On the other hand Schindler is shown in the same house he has acquainted saying "it couldn't be better". had then gone on to comfort Suky Tawdry (a friend of Jenny's) too, she lets slip that he was still with her. Peachum takes advantage of this slipped information and orders Filch to tell the police of Mac's location whilst the whores have a cup of tea. During the trial, Craig denied the words were said. One police officer confirmed this in his statement, writing, "I did not write it down because I did not hear it. I did not hear it down because it was not said". expressionism, strange effects and the alienation technique.) This also helped class the thriller as a psychological. Once all the clips were ordered on the timeline in the editing suite, we began to look for a balance of length of shot as well the thematic structure of the film.